VMC Media Player is the PUP that uses misleading techniques to prevent removal. Use Reimage to locate malicious components and get rid of them faster than with uninstall instructions. A full system scan blocks virus reappearance and prevents traffic to malicious domains. What dangers lie behind VMC Media Player virus? How should I perform VMC Media Player removal? Downloading VMC Media player from secondary and unreliable sources might have highly destructive consequences on your computer. Recently, hackers decided to use this application as a disguise for launching VMC Media Player virus. This particular cyber threat has been categorized as a tech support scam. 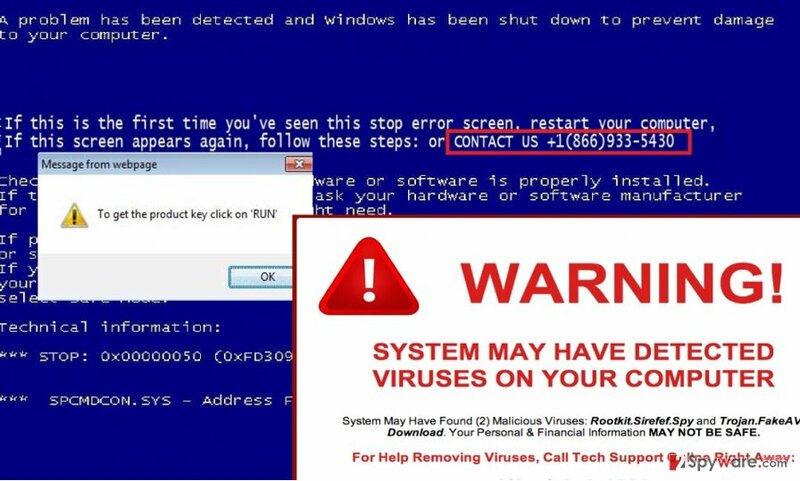 As other malware of the same kind, it tries to convince users of fake Windows errors so that frightened users would call the given number. If you have fallen into the trap of this virtual deception as well, find out about VMC Media Player removal methods. This particular virus spreads via the modified version of VMC Media Player. After the download of the corrupted program is complete, the virus will activate its fatalerror.exe file. With the help of it, your computer switches off and the screen changes into the BSOD (“Blue Screen of Death”) stating that it was necessary to turn off the computer in order to prevent possible damage. Certainly, such statement highly terrifies users; the inexperienced ones might start panicking. Hackers exploit such emotional state and urge victims to call the specified tech support scam. On the blue screen, you might notice additional window telling you to obtain the license file specifically, license_key.exe, which is affiliated with another malware – Windows Product Key Activation virus. Lastly, the scam includes a fake Microsoft button. After clicking it, you will be directed to the www.microsoft.aios(us) website to install a remote access tool. It is promoted as a necessary program for the supposed technical specialist to help you. Originally, when computer encounters a real error which forces it to shut down, it does not display any additional windows and especially does not include any telephone number. You can regard this feature as the common property of all tech support scams. Hackers aim to convince users into thinking that a real technician is ready to help them. In fact, the primary goal of all such scams is to wheedle out money. Thus, after calling the supposed specialist, you may be persuaded into purchasing completely futile but malicious software. As a result, after installing such software, your computer might suffer from a real crash and a series of other destructive effects. All in all, remove VMC Media Player malware (alternatively known as Fatalerror Scam) before it causes more trouble. For such purpose, use Reimage. As previously mentioned, you may have downloaded this virtual threat through the corrupted version of VMC Media Player. Thus, it is of utmost importance to check the official publisher of the program you are willing to install. The fake and, often the fraudulent versions, include other or “Unknown” publisher. In addition, another possibility how this virus got into your computer is via other free applications. Unfortunately, few users give a second look before performing the installation of a new tool. As a result, they may install a bunch of unnecessary programs or worse – a virus. To prevent such scenario in the future, follow these recommendations. After opening the installation wizard, select “Custom” settings. After that, carefully unmark all optional programs which cause any suspicion. Since this malware is not a mere and ordinary threat, we recommend you to get rid of it automatically. Install an anti-spyware application, for example, Reimage or Plumbytes Anti-MalwareMalwarebytes Malwarebytes. You can be sure that it will remove VMC Media Player virus right away. In addition, the security program will check for other threats on your device. We do not recommend manually deleting the malware because you may not succeed in locating all the files. Lastly, remember to pay extra attention while installing new applications and download them only from the trusted and official sources. This entry was posted on 2016-07-29 at 00:58 and is filed under Malware, Viruses. You can quickly scan the QR code with your mobile device and have VMC Media Player virus manual removal instructions right in your pocket. How did you remove VMC Media Player virus?